Partendo dal presupposto che i basenji solitamente sono cani sani e con pochi problemi o con la possibilità di ammalarsi come qualunque altra razza canina, tempo fa ho archiviato queste pagine in inglese a titolo informativo. E' necessario fare attenzione perchè passando gli anni la diffusione di questa razza e il numero di cucciolate e cuccioli arrivati/nati in Italia è aumentato sensibilmente nonostante l'handicap del solo calore annunale. Il maggior numero di esemplari sul nostro territorio potrebbe fare aumentare il numero di esemplari non sani o con patologie molto serie. Sapere e testarli o prendere e pretendere basenji testati non è difficile. Molti test sono semplici tamponi della saliva e il risutalto è veloce sia che sia fatto in Italia o all'estero. Fanconi Syndrome is a kidney disorder that was first reported in the Basenji in 1976. The normal function of the kidney is to filter the blood, reclaiming amino acids, electrolytes, and important chemicals and letting the wastes leave the body via the urine. With Fanconi Syndrome, the cells of the proximal tubule in the kidney do not function properly so that chemicals that should be reclaimed by the body spill out into the urine instead. The body thus loses vital nutrients needed for normal functioning. Symptoms of this disorder are: increased thirst, frequent urination, dehydration, weight loss, changes in haircoat, weakness and frequent urinary tract infections. The signs can mimic Diabetes. However, there are not correspondingly high blood sugar levels. Many vets have falsely labelled the disorder diabetes, kidney failure or thyroid deficiency due to lack of knowledge of the syndrome. The signs may appear as early as the age of three, but Basenjis between the ages of five and eight have shown the highest rate of occurrence but unfortunately, by this age, the dog may have already passed the condition on. A DNA marker test, which looks for multiple markers, was used from 2007 to August 2011. Dogs tested during this period have OFA results which are recorded as “probable” results. The current direct DNA test, which began to be used in August, 2011 gives definitive results. Results will either be Clear, Carrier or Affected. Thanks to the research and dedication of these scientists, Fanconi Syndrome can now be eliminated from the breed by careful breeding practises. It is strongly encouraged to avoid breeding from any Basenji that has tested as “Affected” and until more is understood about the complete genetics involved, for great care to be taken when breeding from carriers. PROGRESSIVE RETINOL ATROPHY - PRA is considered rare in the Basenji but it has been diagnosed in Australia. PRA affects the retina, which is the picture screen at the back of the eye. PRA causes the blood vessels of the retina to atrophy and die. When the retina dies the picture screen no longer functions and the dog becomes blind. The first symptom usually noticed is that of night blindness which can progress slowly or rapidly to total blindness. This condition is irreversible and there is no cure but there is some evidence that nutitional support with anti-oxidants can slow the progression of the disease and support the health of the retina to prolong sight. It is inherited recessively however a carrier will have normal eyes. NEW DNA TEST FOR PRA IN BASENJISA DNA test for one form of PRA in Basenjis is now being offered by the OFA. The Basenji Club of Victoria is very happy to announce that Dr. Johnson is now offering a DNA test for progressive retinal atrophy (PRA) in Basenjis through the Orthopedic Foundation for Animals (OFA)! This test will identify individual dogs as clear, carrier, or affected for one form of PRA in basenjis, being referred to as PRA-BJ1. This test will be a cheek swab test, and the genotyping will be done by PCR, like the current Fanconi test. New samples will need to be submitted to OFA for this test. It may be possible to obtain results from existing samples if the dog is deceased. These test kits can be ordered at the OFA website here: Order DNA test - This is a direct DNA test. The cost for this test is $65. Persistent Pupillary Membrane is very common in Basenji puppies and can reduce and disappear with age however it is still important to be considered in any breeding program. It is estimated that the majority of Basenjis do have PPM to some degree. During foetal development, a fibrovascular tissue, the Pupillary Membrane, forms a layer across the front of the eye to form a blood supply to nourish the developing lens. Normally this temporary membrane deteriorates and is completely gone by the time the puppy is 14 days old. When it does not deteriorate completely by 14 days of age, it is known as Persistent Pupillary Membrane (PPM). This condition is not progressive and does not require any treatment. PPM's come in all shapes, sizes and severities, it may be very extensive and visible to the naked eye or may be very tiny and require considerable magnification to be seen. Iris to Iris strands of PPM generally cause no problems and may persist for several months before disappearing completely. Iris sheets however can lead to blindness and if the ppm are attached to the cornea or lens the remaining strands may eventually lead to cataracts. Examination for PPM should be done by a veterinary ophthalmologist through the use of a 'slit lamp' exam when the puppy is 6-8 weeks old. Puppies must be microchipped prior to the eye examination to be included in the ACES scheme. COLOBOMA is the complete or partial absence of part of the eye usually the optic nerve disk in Basenjis. Optic nerve Coloboma can cause considerable impairment because the optic nerve is the part that transmits visual signals to the brain. Coloboma is a congenital condition which means that the condition is present at birth and can sometimes be associated with severe PPM. Dogs affected by Coloboma should not be bred since the mode of inheritance is not yet understood. Some Basenjis have optic nerves that are more deeply cupped than other breeds so a second opinion from an Opthamologist that is familiar with Basenji eyes is recommended if there is any doubt. Puppies can be tested for this condition at 6-8 wks and puppy buyers should always be advised by the breeder prior to purchase of a puppy if it has been diagnosed with Coloboma as vision is likely to become impaired. The Thyroid gland also known as the Master Gland is the control centre of the body, therefore thyroid deficiency can present with a wide variety of symptoms, some of which can be characterised by a course brittle coat, aggressiveness, lethargy, obesity, mental dullness and irregular heat cycles amongst a myriad of other possible symptoms. Owners of Basenjis need to advise their veterinarian that Basenjis can have lower normal ranges for T4 and T3 concentrations as compared to other breeds, so a low-normal result may be quite normal for this breed. Diagnosis is by means of Blood tests - The most comprehensive Thyroid blood panel comprises of: Free T4 by dialysis, T3, Free T3, TSH and TGAA available through Hemopet in the U.S through Dr.Jean Dodds - World renowned Thyroid specialist. Instructions and forms are on the website. It is very difficult to get the correct tests carried out in Australia - especially the TSH and TgAA tests so it is recommended to have the testing done through Hemopet for correct interpretation and diagnosis. Dr. Dodds is readily available to discuss any concerns via EMAIL. Treatment is simply the administration of a daily Thyroxine tablet. A hereditary autoimmune disease. Affected dogs produce auto-antibodies against their own thyroglobulin which in turn may eventually attack the thyroid gland although not all dogs with positive results will develop the disease. Although heredity is not yet fully understood it is generally agreed that it is caused by a single recessive gene. The best current marker for this disease is a positive TgAA test result after the age of 12 mths along with elevated TSH levels - It is rare to develop this condition after the age of 5 yrs and by then TgAA levels may have decreased so the TSH test becomes a more helpful diagnostic tool if ALT is suspected. The blood test to ask for is TgAA = Canine Thyroglobulin autoantibody. Carriers are not currently detected by testing. Research into Thyroid issues as performed by clinical laboratories is ongoing. Canine Hip Dysplasia (CHD) appears to be rare in the Basenji, but has been diagnosed. The development of hip dysplasia is determined by an interaction of multiple genetic and environmental factors. The hip joints fail to develop normally, and from the age of 4 months can begin to deteriorate and lead to loss of function of the hip joints and severe pain. In an abnormal hip, the head of the femur fits loosely into a poorly developed, shallow acetabulum. Joint instability occurs as skeletal growth is faster than muscle development. As the stress of weight-bearing exceeds the strength of the supporting connective tissue and muscle, the joint becomes loose and unstable and degeneration occurs. Hip Dysplasia is diagnosed radiographically by the presence of degenerative changes and/or subluxation of the hip joint(s). Dogs in a breeding program should wait until fully developed at around 2 yrs before being x-rayed for CHD. In 2012 the Australian average score for Basenjis is 6.9. This is the total of each hip score (right and left) added together. Environmental factors such as diet and exercise can also be involved. Feeding a very high-calorie diet to growing puppies can exacerbate a predisposition to hip dysplasia, due to rapid growth placing increased stress on the hip joints. Too much exercise in a growing puppy has been known to speed up the development of hip dysplasia if predisposed. Running on hard surfaces such as roads and pavement should be avoided in young puppies. Umbilical Hernia are quite common in Basenjis. An umbilical hernia results from failure of the umbilical ring to close after birth allowing protusion of fatty tissue (belly button). In severe cases, the intestinal lining protrudes which can cause intestinal blockage. In most cases the umbilical ring will eventually close, leaving a small lump of fatty tissue for a belly button. Young puppies whose umbilical ring has not closed will benefit from repeatedly reducing the hernia by gently pressing in with your thumb. The puppy should always be lifted with a hand under its tummy to support any hernia. If the hernia itself should appear red or inflamed, seek immediate medical attention. If the hernia should fail to close by one year of age and is overly large, it should be surgically repaired. If it is not large and there is no change, it should not present any problem. Inguinal Hernia are quite rare in Basenjis and are most often caused by a wider hole in the groin area than normal and fat and/or a bit of the intestine can fall out and make a bag which consists of skin and peritoeum. In males a bigger hernia can develop and cause a hernia in the scrotum as well. Inguinal hernias are congenital in most cases but older animals can also aquire them through trauma. If the hernia is large it will need to be repaired by surgery. IPSID is a genetically-mediated severely debilitating diarrhoea disease of the Basenji. Clinical symptoms can vary -- you may see: chronic diarrhoea,poor appetite, aversion to food, occasional vomiting, weight loss, unthriftiness, dry coat and skin, hair loss etc. An electrophoresis study of the serum ( the liquid portion of the blood) shows a marked increase in the gamma globulins and a corresponding decrease in the albumin. These changes noted in the Protein Electrophoresis Test have proven to be a useful tool in confirming diagnosis of IPSID in dogs with some of the symptoms. Current research is aimed at the effects of diet on the development and course of the disease; treatments with antibiotic and vitamin therapies; and attempts to discover the mode of inheritance. Haemolytic Anaemia at one time was considered a major threat to the breed but today is rarely seen. This is a real triumph for the breeders who worked so hard to eliminate the disease. HA is a condition in which the red blood cells are destroyed more rapidly than normal. This genetically transmitted disease is caused by a partial lack of a very important enzyme in the red blood cells called Pyruvate Kinase (PK for short). Symptoms for the dogs begin very early and owners notice that the affected animals tire easily and sleep a great deal. Most succumb when approximately two years of age. In the early 1970's, much research into this disease proved that PK deficiency in the Basenji was due to a recessive gene. 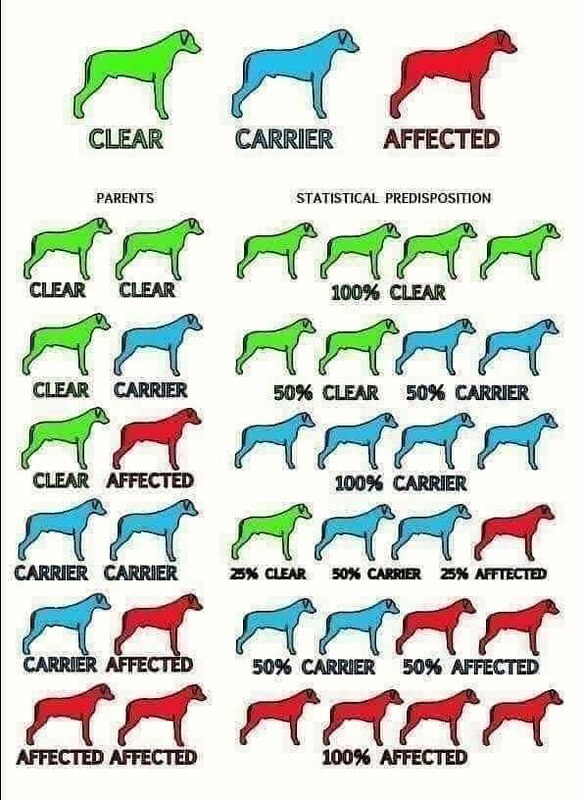 The extensive research done in the 1970's led to sensitive testing that could distinguish between the clear, carrier, and affected animals. Through discriminate breeding practices, avoiding mating a carrier to a carrier, and continued testing over several generations, HA has been drastically reduced. Fortunately, there has not been a case of HA reported in Australia for many years. se si fanno nascere cuccioli da una coppia di cani testati molti problemi o malattie si possono evitare.